275g chicken breast and thigh meat, skin and boned. Drain the canned pineapple into a bowl.Reserve about 13 large chunks of pineapple. squeeze the juice from remaining chunks into a bowl, then discard the chunks. you should roughly 120 ml of pineapple juice. In a large bowl, blend together the cumin, ground coriander, garlic, chilli powder, slat, yogurt, fresh coriander. Pour in the pineapple juice and mix together. Cut the chicken into cubes, add to the yogurt and spice mixture and leave to marinate for up to 2 hours. Cut the peppers and onion into chunks. 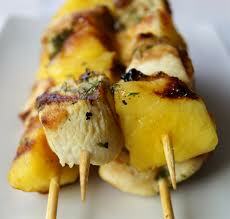 Arrange the chicken pieces, vegetables and pineapple pieces alternately on to 6 skewers. Brush the kebab with oil and cook on a medium barbecue or griddle pan for roughly 10 minutes, turning regularly and basting the chicken regularly with the remaining marinade, until hot and cooked throughly. Kebab ( or kabab, kabob) is a wide variety of meat dishes originating in Persia and later on adopted in the Middle East, Turkey, South Asia and Asia Minor, that are now found worldwide. In North American English, kebab with no qualification generally refers more specifically to shish kebab served on the skewer. 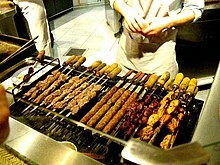 In the Middle East, however, kebab includes grilled, roasted, and stewed dishes of large or small cuts of meat, or even ground meat; it may be served on plates, in sandwiches, or in bowls. The traditional meat for kebab is lamb, but depending on local tastes and taboos, it may now be beef, goat, chicken, pork; fish and seafood; or even vegetarian foods like falafel or tofu. Like other ethnic foods brought by travellers, the kebab has become part of everyday cuisine in many countries around the globe. The origin of kebab may lie in the short supply of cooking fuel in the Near East, which made the cooking of large foods difficult, while urban economies made it easy to obtain small cuts of meat at a butcher’s shop. The phrase is essentially Persian in origin and Arabic tradition has it that the dish was invented by medieval persian soldiers who used their swords to grill meat over open-field fires.According to Ibn Battuta, a Moroccan traveller, in India, kebab was served in the royal houses during the Delhi Sultanate period(1206-1526 AD), and even commoners would enjoy it for breakfast with naan. The dish has been native to the Near East and ancient Greece since antiquity; an early variant of kebab (Ancient Greek: ὀβελίσκος – obeliskos) is attested in Greece since 8th century BCE (archaic period) in Homer’s Iliad and Odyssey and in classical Greece, amongst others in the works of Aristophanes, Xenophon and Aristotle. Excavations held in Akrotiri on the Greek island of Santorini by professor Christos G. Doumas, unearthed stone sets of barbecue for skewers (Ancient Greek: κρατευταί – krateutai) used before the 17th century BCE. In each pair of the supports, the receptions for the spits are found in absolute equivalence, while the line of small openings in the base constitutes mechanism of supplying the coals with oxygen so that they are maintained light up during its use. Left to right: Chenjeh Kebab, Kebab Koobideh, Jujeh Kebab in an Afghan restaurant. The kebab term is applied to Azerbaijani, Armenian, Arabic, Turkish, Afghan, Cypriot, Kurdish, Iranian, Iraqi, Central Asian. Shish kebab (Turkish: Şiş Kebap, in which şiş is the Turkish word for “skewer,”) is a dish consisting of meat threaded on a skewer and grilled. Any kind of meat may be used; cubes of fruit or vegetables are often threaded on the spit as well. Typical vegetables include eggplant, tomato, bell pepper, onions, and mushrooms. In North American English, the word “kebab” usually refers to shish kebab. İskender kebap, the original döner kebab invented in Bursa, Turkey. Slicing döner kebab off a rotating vertical spit. Döner kebab, literally “rotating kebab” in Turkish, is sliced lamb, beef or chicken, slowly roasted on a vertical rotating spit. The Middle Eastern shawarma, Mexican tacos al pastor and Greek gyros are all derived from the Turkish döner kebab which was invented in Bursa in the 19th century by a cook named Hacı İskender. Döner kebab is most popularly served in pita bread, as it is best known, with salad, but is also served in a dish with a salad and bread or French fries on the side, or used for Turkish pizzas called pide or “kebabpizza”. Take-out döner kebab or shawarma restaurants are common in many parts of Europe. Döner kebab is popular in many European countries, Canada, New Zealand and Australia. 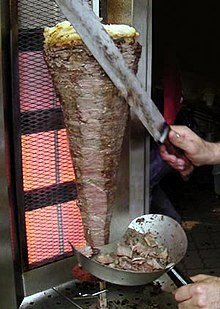 In parts of Europe ‘kebab’ usually refers to döner kebab in pita. Australian Doner Kebabs are usually served in wraps which are toasted before eating. In Australia and the UK, kebabs (or döner meat and chips) are most popularly eaten after a night out, representing a large part of nightlife culture. As a result, many kebab shops (and vans) will do their main business in the hours around closing time for local pubs and clubs (usually from 10 pm to 4 am). The same applies for Belgium, the Netherlands, Poland, Ireland, New Zealand, Canada, Scandinavia and Italy. It is therefore not uncommon to find similar late-night kebab vending shops in holiday-clubbing destinations such as Ibiza and Thailand. Health concerns about döner kebab, including unacceptable salt and fat levels and improper labeling of meat used, are repeatedly reported in UK media. The German-style döner kebab was supposedly invented by a Turkish immigrant in Berlin in the 1970s, and became a popular German take-away food during the 1990s, but is almost exclusively sold by Turks and considered a Turkish specialty in Germany. Kenjeh is a popular meat dish in the Middle East. It originated in Iran, where it is called ‘Chenjeh’ and was later adopted in Asia Minor. Kebab Kenjeh is now found worldwide. Lamb is traditionally the meat used in this dish. The ingredients include lamb, olive oil, lemon juice, salt, and pepper. It is usually served with rice, grilled tomato, and raw onion. There are also local variations in the pronunciation of Kenje Kebab کنجه کباب. Kakori kebab is a South Asian kebab attributed to the city of Kakori in Uttar Pradesh, India. There is much folklore about this famous kebab that takes its name from a small hamlet called Kakori on the outskirts of Lucknow. One such story says that the kakori kebab was created by the Nawab of Kakori, Syed Mohammad Haider Kazmi, who, stung by the remark of a British officer about the coarse texture of the kebabs served at dinner, ordered his rakabdars (gourmet cooks) to evolve a more refined seekh kebab. After ten days of research, they came up with a kebab so soft and so juicy it won the praise of the very British officer who had scorned the Nawab. The winning formula his rakabdars came upon included mince obtained from no other part but the raan ki machhli (tendon of the leg of mutton), khoya, white pepper and a mix of powdered spices. Chapli kebab is a patty made from beef mince, and is one of the popular barbecue meals in [Afghanistan]. The word Chapli comes from the Pashto word Chaprikh which means flat. It is prepared flat and round and served with naan. The dish originates from Mardan Mardan is famous for chapli kabab not only locally but also internationally. Umar Kabab at Mardan City, Daood and Farman Kabab from Takht Bai, Mayar Kabab from Mayar and Shankar Kabab are famous around the country in all seasons. In Mansehra, shinkiari and ichrean are very famous for chapal kabab. Burrah kebab is another kebab from Mughlai Cuisine, fairly popular in South Asia. This is usually made of goat meat, liberally marinated with spices and charcoal grilled. Kalmi Kebab served with onions and cabbage in Delhi, India. Kalmi kebab a popular snack in Indian cuisine. The dish is made by marinating chicken drumsticks and placing them in a tandoor. Various kinds of freshly ground Indian spices are added to the yogurt used for the marination of the chicken. When prepared, the drumsticks are usually garnished with mint leaves and served with onions and Indian bread. One of the more delicate kebabs from South Asia, made of minced goat / buffalo meat. Legend has it that the galawati kebab was created for an aging Nawab Wajid Ali Shah of Lucknow who lost his teeth, but not his passion for meat dishes. ‘Galawati’ means “melt in your mouth” and was perfect for the toothless Nawab who continued savouring this until his last days. Traditionally, green papaya is used to make it tender. After being mixed with a few select herbs and spices (great chefs rarely reveal what they are exactly), the very finely ground meat is shaped into patties and fried in pure ghee until they are browned. The original recipe that brought many a smile on the Nawab’s face, albeit toothless, and many a sigh of satisfaction, is supposed to have more than 100 aromatic spices. 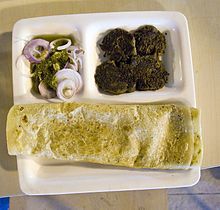 The Galouti Kebab is part of the “Awadhi Cuisine”. Along with the Lucknowi biryani and Kakori Kebab, this is one of the outstanding highlights of the great food tradition from the Awadh region in Uttar Pradesh, India. Many leading Indian hotel chains have taken to popularising the Awadhi food tradition, with the Galouti Kebab being a Pièce de résistance. The home of this kebab is Lucknow. It is most famously had at the almost iconic eatery “Tundey Miyan” at Old Lucknow. 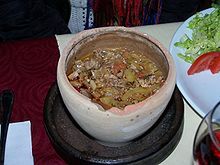 A dish from Central Anatolia and the Mid-Western Black Sea region, consisting of a mixture of meat and vegetables cooked in a clay pot or jug over fire(testi means jug in Turkish). The pot is sealed with bread dough or foil and is broken when serving. 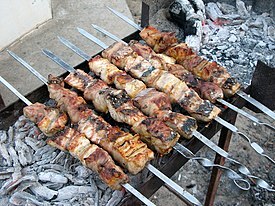 Adana kebabı( or kıyma kebabı) is a long, hand-minced meat kebab mounted on a wide iron skewer and grilled over charcoal. Chelow kebab (Persian: چلوکباب‎) is a national dish of Iran. The meal is simple, consisting of steamed, saffroned basmati or Persian rice (chelow) and kabab, of which there are several distinct Persian varieties. This dish is served everywhere throughout Iran today, but traditionally was most closely associated with the northern part of the country. It is served with the basic Iranian meal accompaniments, in addition to grilled tomatoes on the side of the rice, and butter on top of the rice. It is an old northern tradition (probably originating in Tehran) that a raw egg yolk should be placed on top of the rice as well, though this is strictly optional, and most restaurants will not serve the rice this way unless it is specifically requested. “Somagh”, powdered sumac, is also made available and its use varies based on tastes to a small dash on the rice or a heavy sprinkling on both rice and meat, particularly when used with red (beef/veal/lamb) meat. In the old bazaar tradition, the rice (which is covered with a tin lid) and accompaniments are served first, immediately followed by the kebabs, which are brought to the table by the waiter, who holds several skewers in his left hand, and a piece of flat bread (typically nan-e lavash) in his right. A skewer is placed directly on the rice and while holding the kebab down on the rice with the bread, the skewer is quickly pulled out. With the two most common kebabs, barg and koobideh, two skewers are always served. In general, bazaar kebab restaurants only serve these two varieties, though there are exceptions. The traditional beverage of choice to accompany kebab is doogh, a sour yogurt drink with mint and salt. Kabab koobideh (Persian: کباب کوبیده‎) or kūbide (Persian: کوبیده‎) is an Iranian minced meat kabab which is made from ground lamb, beef, or chicken, often mixed with parsley and chopped onions. Kabab Koobideh contains: ground meat, onion, salt, pepper, turmeric, and seasoning. These ingredients are mixed together until the mixture becomes smooth and sticky. One egg is added to help the mix stick together. The mixture is then pressed around a skewer. Koobideh Kabab is typically 7–8 inches (18–20 cm) long. Kabāb-e Barg (Persian: کباب برگ‎) is a Persian style barbecued lamb, chicken or beef kebab dish. The main ingredients of Kabab Barg – a short form of this name — are fillets of beef tenderloin, lamb shank or chicken breast, onions and olive oil. Jūje-kabāb (Persian: جوجه‌کباب‎) consists of pieces of chicken first marinated in minced onion and lemon juice with saffron then grilled over a fire. It is sometimes served with grilled tomato and pepper. Jujeh kabab is one of the most popular Persian dishes. Combination of Jujeh Kabab and Kabab Barg in a decussate form. The main varieties include kabob e chopan, chapli kabob, teka kabob, shaami kabob, and rudi kabob. 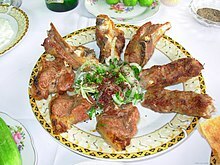 Tika kabab and lyula kabab from mutton, as served in Qəçrəş, Quba Rayon, north-eastern Azerbaijan. The main varieties include tika kabab, lyula kabab (doyma kabab in some places), tas kababy and tava kabab. The meat for tika kabab is sometimes prepared in basdirma (an onion gravy and thyme) and then goes onto the ramrods. When served, it could be adorned with sauce-like pomegranate addon (narsharab) and other condiments, and may also be served wrapped in Lavash. In Bulgaria, the word кебап (kebap) refers to meat stews with relatively few or no vegetables. Dishes which are known in English as different kinds of “kebab” are not perceived as a distinct group of dishes. The Döner kebab is wide spread as fast food and is called merely дюнер (döner) thus not relating it to the Bulgarian кебап at all. Шиш кебап (Shish kebap) or Шашлик (Shahlik) is also common and has the same name as in Turkish. 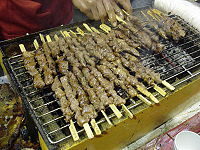 Chuan-style lamb kebab sticks sold by a street vendor. Chuanr 串 called “chuàn” in Mandarin or often referred to as “Chua’r” in Pekingese throughout the North, is a variation of kebab originating from the Western Chinese province of Xinjiang and a popular dish in Chinese Islamic cuisine. It has since spread across the rest of the country and become a popular street food. Small pieces of meat are skewered and either roasted or deep-fried. Common spices and condiments include Chinese style of cumin called “ziran”, pepper, sesame, and sesame oil. Although the most traditional form of chuanr uses lamb or mutton, other types of meat, such as chicken, beef, pork, and seafood, can be used as well. During Chinese New Year, it is common to find fruit kebabs candied and covered with a hard candy sugar coating. At the famous Wángfǔjǐng in Beijing, it is very common to find many kinds of fruit kebabs of everything from bananas, strawberries, and seasonal Chinese fruits, as well as scorpions, squids, and various Japanese flavored kebabs all year long. Kebabs in Malaysia are generally sold at pasar malam (night markets) and in shopping mall food courts. Normally the meat, after being cut from the spit is pan fried with onions and chilli sauce then placed into a pita bread pocket before being filled with condiments such as tomatoes, mayonnaise, onion and lettuce. Steam kebab (Turkish Buğu kebabı) is a Turkish kebab dish which is prepared in an earthenware casserole. The casserole’s lid is sealed with dough in order to cook the meat in its own juices. The dish is prepared with pearl onions, garlic, thyme, and other spices. In Tekirdağ, it is served with cumin; in Izmir, it is served with mastic. Anticuchos (Andean) · Banderilla (México) · Brochette (French) · Ćevapi (Balkan) · Chuanr (Chinese) · Kawap (Uygur) ·City Chicken (Ohio Valley-Upstate New York) ·Donair (Canadian) · Espetada (Portuguese) · Espetinho (Brazilian) · Frigărui and Mititei (Romanian) · Kebakko (Finland) · Khorovatz (Armenian) · Mtsvadi (მწვადი -Georgian) · Pinchitos (Spanish Andalusian) · Rablóhús (Hungarian) · Satay (Southeast Asia) · Shashlik (Russian) · Sosatie (South African) · Souvlaki (Σουβλάκι- Greek) · Spiedies (New York State) · Spiedino (Italian) · Suya (Nigerian) · Kkochi (Korean) · Kushiyaki and Yakitori (Japanese).